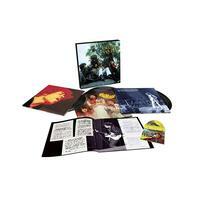 Electric Ladyland 50th Anniversary Super Deluxe Edition box set! 180-gram 6LP + Blu-ray / LPs plated and pressed at Quality Record Pressings! Original album remastered by Bernie Grundman from the original analog tapes! "...this album is a joy to behold with its 'new' found nuances, through the multitude of differing musical shades on offer for the first time. There has been nothing like this before in relation to this pressing, it now has me wondering what I'm going to experience with the stereo and mono re-masterings from Bernie Grundman with the upcoming UHQR Axis. Bold As Love." — Electric Ladyland 50th Set review, Gordon Johnson, jmhvinyl.co.uk, Jan. 22, 2019. Read the entire review here. In celebration of the 50th anniversary of the release of the Jimi Hendrix Experience masterpiece Electric Ladyland, Experience Hendrix, L.L.C. and Legacy Recordings, the catalog division of Sony Music Entertainment, are releasing the Deluxe Edition box set on November 9, 2018. Available as either a 3CD/1 Blu-ray set or a 6LP/1 Blu-ray set, both packages include the original double album, now newly remastered by Bernie Grundman from the original analog tapes. For the LP set, Grundman prepared an all-analog direct-to-disc vinyl transfer of the album, preserving the authenticity. Also included is Electric Ladyland: The Early Takes, which presents demos and studio outtakes from this period in Hendrix's career, plus a new 5.1 surround sound mix of the entire original album by Hendrix's original engineer Eddie Kramer. This marks the first and only time this has been done with a Hendrix studio album, and gives listeners the original stereo mixes in uncompressed 24 bit/96 kz high resolution audio. Jimi Hendrix Experience: Live At the Hollywood Bowl 9/14/68, part of Experience Hendrix's Dagger Records official bootleg series, is another exclusive component. The never-before released recording captures the band and the mounting excitement that took place just weeks before the release of Electric Ladyland. The Blu-ray also includes the acclaimed, feature length documentary At Last... The Beginning: The Making of Electric Ladyland. Lastly, Electric Ladyland Deluxe Edition includes a full color, 48-page book containing Jimi's handwritten lyrics, poem and instructions to his record label, as well as never-before published photos from the recording sessions that were shot by Eddie Kramer himself. The fully restored documentary At Last … The Beginning: The Making Of Electric Ladyland which documents the creation of the Jimi Hendrix Experience’s groundbreaking double album. Includes interviews with Chas Chandler, Mitch Mitchell, and Noel Redding as well as fascinating in-the-studio footage introduced by Eddie Kramer. Originally produced in 1997 as part of the Classic Albums television series, this expanded edition features almost 40 minutes of additional content not seen in the original feature.